With towering trees, snowcapped mountaintops and a close-knit community, Jackson County has been a picturesque holiday getaway for more than a century. 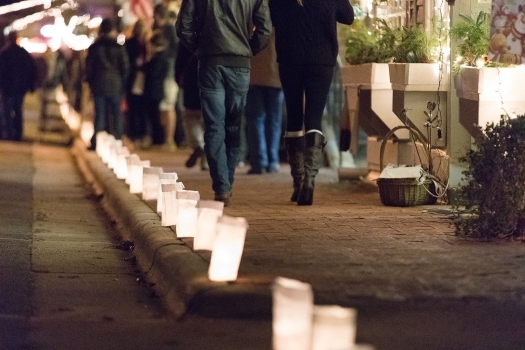 A Christmas here shines with tradition, including caroling on the steps of the historic courthouse and candle-lit luminaries lining the way to shops in Dillsboro and Sylva. The two towns take on a storybook quality, with lights outlining buildings and lamp posts, and holiday ribbons and greenery everywhere. 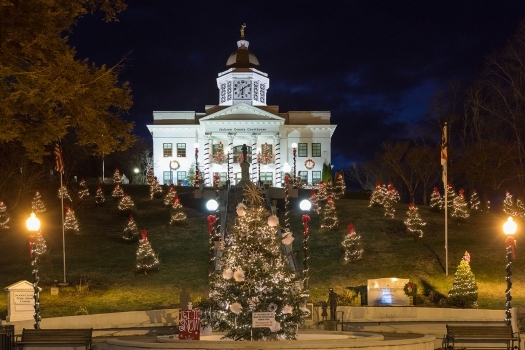 Perhaps the most spectacular sight at Christmas is Sylva’s stately old courthouse (now part of the Jackson County Library), which features candles in the windows, candy-cane wrapped columns and at least a dozen Christmas trees adorning its stately lawn. In earlier days, however, Christmas perhaps meant more, because it broke the monotony of dark winter days. Families went into the forest to cut a fresh evergreen, traditionally a cedar, to decorate for their Christmas tree, and planned a festive meal to be shared with extended family. Children dreamed of Santa Claus and what they might find under the tree on Christmas morning. While eating is still a big part of the holidays, in the early years of the 20th century, the delicacies, like everything else, were mostly homemade. The late Alberta Zachary, who lived in Cashiers, said that Christmas seemed more special back before 1920. “We used real candles to light the tree, and a tree decorated with real candles is the most beautiful sight. Of course, the grown-ups never left the room when the tree was lit, and the candles were only lighted on Christmas morning. When she and her sisters woke up on Christmas morning, the whole house would be warm, because her father had built fires in all the fireplaces. On ordinary mornings there would only be a fire in the wood stove. She and her family would sing Christmas carols around the piano before breakfast. Alberta said her mother and aunt who lived with them cooked for days before Christmas. She didn’t remember fruitcake, but there were mince pies and little chess pies in tart shells. There was fresh coconut cake, and the children stood on a box to grate the coconut. The main course was baked ham, not turkey. One very special food from her childhood Christmas dinners was pigs-foot jelly. “That was a real delicacy. It was made by boiling the pigs’ feet and straining and clarifying the broth until it was pure gelatin. It was sweetened and flavored with port wine, which made it a beautiful color, and it was served with real whipped cream. Books about the region often describe the traditions associated with that day; Appalachian novelist Lee Smith described Old Christmas as a time when “alder buds will burst and leaf out, and bees will roar in a bee gum like they’re fixing to swarm, and briars will blossom, and animals will speak.” It was said that people would visit back and forth on the night of Jan. 5 (Old Christmas Eve), swapping stories and sitting up late, and that horses and cattle would lay down at midnight, whether in a barn or outside. I checked with mountain musician Mary Jane Queen, who died in 2007 at the age of 93, and she said she could remember her parents talking about such things happening on Old Christmas, but that it was not anything she ever experienced herself. The weather that occurs on the 12 days between Dec. 25 and Jan. 6 rules the weather for the rest of the year, Mary Jane said, with each of those days corresponding to a month on the calendar. She associated the ruling days with a belief in the power of the moon and planting by the signs, a practice she said she when gardening. “I always plant potatoes in April on the full of the moon, and I always have good potatoes,” Mary Jane told me. Anything else that grows beneath the ground – like onions, beets and carrots – should also be planted when the moon is full. Corn, however, should be planted on the new of the moon, she said. The church calendar tells us that Jan. 6 is Epiphany, the day the wise men actually arrived at the stable where Jesus lay, and the “Twelve Days of Christmas” have been immortalized in song. These days, Jackson County’s towns decorate and celebrate longer than 12 days, making December in the mountains a wonderful time to visit and receive a heaping helping of holiday cheer.